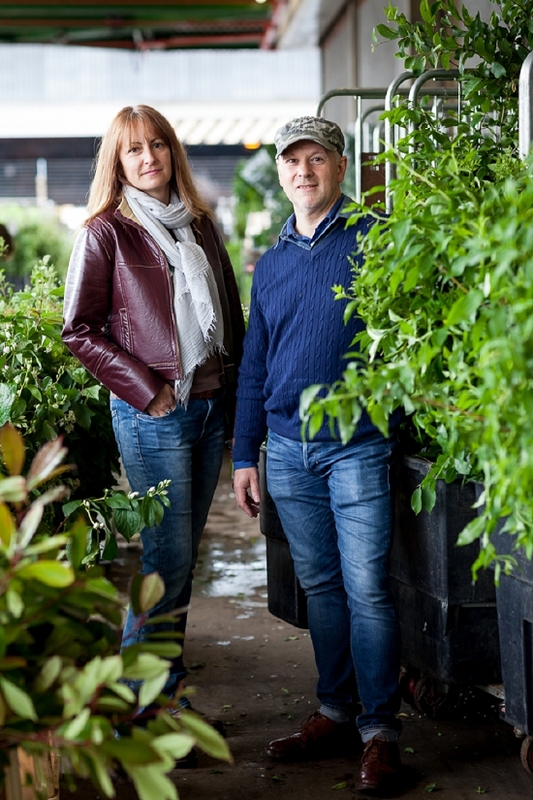 Year Nine of trading looks set to be the best yet for Victoria Taberer-Bond and Simon Nickell, the dynamic florist duo behind Euphoric Flowers. "It takes time to build networks and relationships and a decent presence on social media and now it's paying off," says Victoria. Today, Euphoric Flowers are successful, stylish wedding and event specialists, and preferred suppliers to some of the most prestigious venues in London and the South East. Victoria and Simon both began their lives in flowers 24 years ago. Victoria studied floristry at Waterloo, Simon at Plymouth and they both firmly believe that their formal college training has stood them in good stead. "We are very proud of our training," says Simon. "When you have to wire 20 buttonholes at speed or interpret a client's brief, it pays to have the experience and skills to know what you are doing." The two friends launched Euphoric Flowers in 2005. The name sums them up: they have a zest for life, a great sense of humour, and a creative can-do attitude. Their floral style is exuberant and alive. "Romantic English herbaceous" is their broad-brush description of the style they are most at home with, and they love to use seasonal British flowers and foliage in their work. They also create exuberant garden designs and planting schemes, sensibly delegating the heavy labour of planting. So, can they remember the first time they stepped through the hallowed doors of New Covent Garden Flower Market? "I couldn't sleep the night before," remembers Victoria. "I was in the shadow of Tom of Harper & Tom's, where I was working at the time. 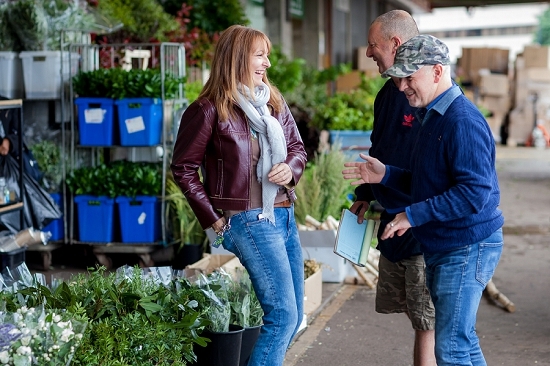 I fell in love with the Market straight away!" Simon was working for Bloomsbury Flowers on his induction to the Flower Market. "It was hilarious! I got trapped in Door 5," laughs Simon. "I remember thinking to myself: 'I can't even get through the doors!'" Both refer to the Flower Market as their 'second home' now, and, as Simon says, "You know that you've 'arrived' when the salesmen wish you 'Good Morning' and know your name!" 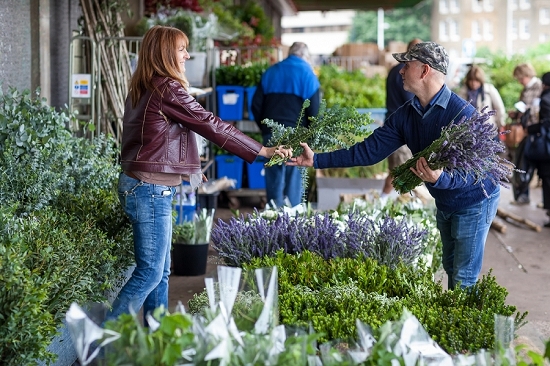 Simon and Victoria travel to the Flower Market from their studio in Thames Ditton every Monday and most Thursdays and Fridays buying for events, weddings and parties. "Their service is wonderful. 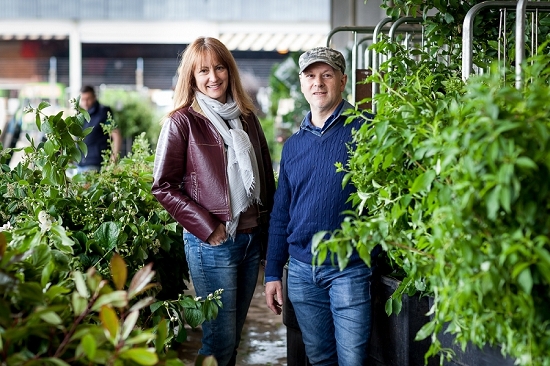 GB Foliage are like family," says Victoria of the specialist supplier of British foliage. "They work with you and are very helpful and informative. For example, we needed huge branches of British-grown double cherry blossom for a very big wedding recently, and it was touch and go with the weather." "David said that all we needed was a spell of rain and the blossom would pop open," continues Victoria. "It rained and the blossom was perfect, just as David said it would be. They insisted on loading all the branches into the van for us too. We just could not have done the event without them. We had a lovely note from the bride afterwards, saying that we had made her dreams come true. That’s why we do what we do."